Jason Dy succeeds to reach The Voice of the Philippines Season 2 Finals and will be representing Team Sarah on the final stage of the competition. Will his heart melting falsetto be able to win him the grand title? 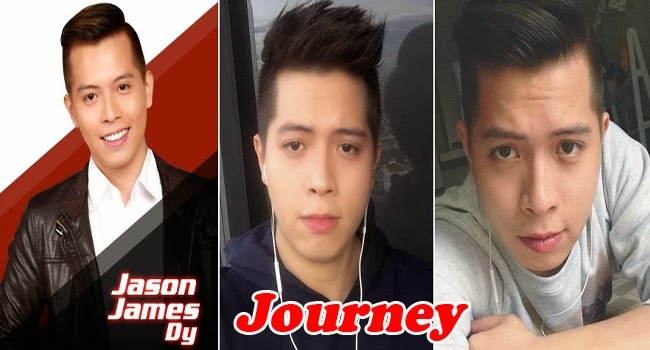 Jason James Dy Desiata is a professional serenader. Like a singing telegram, he sings the love messages of men to their beloved sweethearts. On the Battle Round, Daniel Ombao and Jason Dy went head to head and sang‘On Bended Knees’. Bamboo had rooted for Daniel but Sarah had chosen Jason as she felt that he has more to offer and his gift to tell stories through singing is rare to artists. During the live shows after singing ‘Kahit Kailan’, Jason broke down and he himself was brought to tears when Sarah shared that he is someone who had a strong spirit despite being alone. After his parents got separated, his parents had left him and Jason had been wishing to share his journey with his loved ones. After a few days his mother arrived to see him perform live. He also shared that his semi finals performance of ‘Back at One’ is a song of reconciliation with his father. Jason and Monique serenaded the whole Resort’s World Manila singing ‘Nothings Gonna Stop Now’ for the duet part of semi-finals. His other performances during his journey are ‘Oh My Gosh’, ‘Thinking Out Loud’, ‘Jar of Hearts’ and others. With the overall votes percentage of the public and Sarah’s 55 points, Jason was able to secure the spot as the sole representative of Team Sarah for the Finals. Will the serenader swoon his way towards the grand title? Like this page and follow us to be the first to know.